Calreticulin is an endoplasmic reticulum (ER) chaperone that displays lectin activity and contributes to the folding pathways for nascent glycoproteins. Calreticulin also participates in the reactions yielding assembly of peptides onto nascent MHC class I molecules. By chemical and immunological criteria, we identify calreticulin as a peptide-binding protein and provide data indicating that calreticulin can elicit CTL responses to components of its bound peptide pool. In an adoptive immunotherapy protocol, dendritic cells pulsed with calreticulin isolated from B16/F10.9 murine melanoma, E.G7-OVA, or EL4 thymoma tumors elicited a CTL response to as yet unknown tumor-derived Ags or the known OVA Ag. 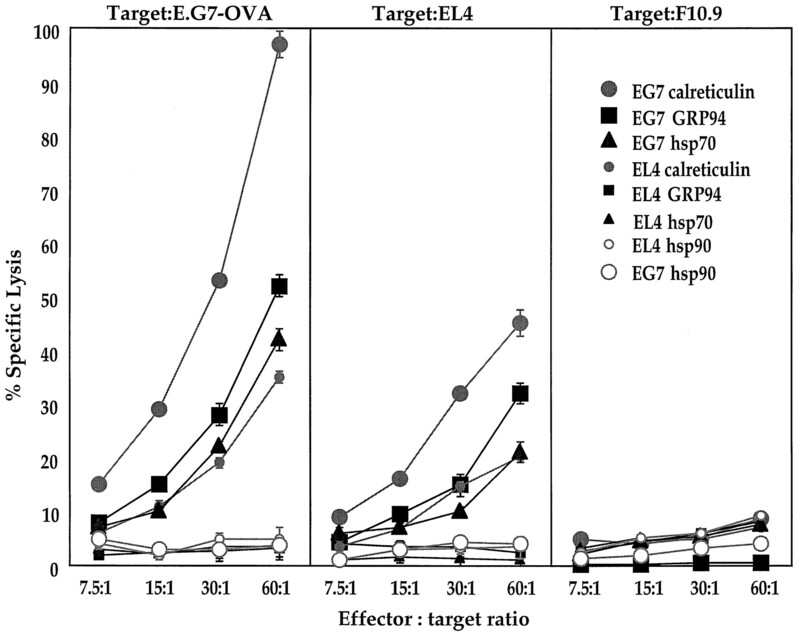 To evaluate the relative efficacy of calreticulin in eliciting CTL responses, the ER chaperones GRP94/gp96, BiP, ERp72, and protein disulfide isomerase were purified in parallel from B16/F10.9, EL4, and E.G7-OVA tumors, and the capacity of the proteins to elicit CTL responses was compared. In both the B16/F10.9 and E.G7-OVA models, calreticulin was as effective as or more effective than GRP94/gp96 in eliciting CTL responses. Little to no activity was observed for BiP, ERp72, and protein disulfide isomerase. 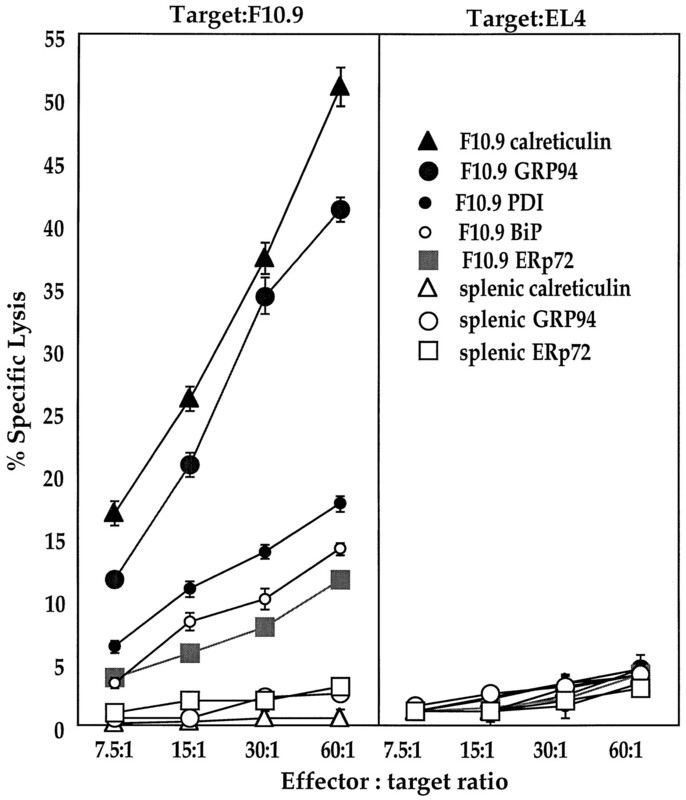 The observed antigenic activity of calreticulin was recapitulated in in vitro experiments, in which it was observed that pulsing of bone marrow dendritic cells with E.G7-OVA-derived calreticulin elicited sensitivity to lysis by OVA-specific CD8+ T cells. These data identify calreticulin as a peptide-binding protein and indicate that calreticulin-bound peptides can be re-presented on dendritic cell class I molecules for recognition by CD8+ T cells. Calreticulin is an abundant 46-kDa resident protein of the endoplasmic reticulum (ER)3 lumen, displays lectin activity, and is known to participate in the folding and assembly of nascent glycoproteins (1, 2, 3, 4, 5). Calreticulin has recently been identified as a component of the MHC class I/transporter associated with Ag presentation (TAP) complex (6, 7, 8). This protein complex, comprising the chaperone calreticulin, the TAP transporters TAP1 and TAP2, tapasin, class I heavy chain, and β2-microglobulin (β2m), functions in the loading of peptides onto nascent MHC class I molecules (6, 7, 8). At present, the precise contribution of calreticulin to peptide loading onto class I heavy-chain β2m dimers remains to be identified. Nonetheless, analysis of the protein-protein interactions preceding peptide loading onto class I molecules shows that calreticulin serves an essential function in regulating the association of class I-β2m dimers with TAP and hence in the regulation of peptide assembly onto nascent class I molecules (6, 7, 8, 9). The composite function of the ER lumenal chaperones is generally thought to be limited to the structural maturation of nascent polypeptides. However, the observations that ER chaperones such as GRP94 (gp96), GRP78 (BiP), and protein disulfide isomerase (PDI) display peptide-binding activity may portend alternative or additional roles for these proteins in the regulation of peptide trafficking within the ER (10, 11, 12, 13, 14, 15). In support of this hypothesis, it is now established that the ER Hsp90, GRP94, binds peptides suitable for assembly onto class I molecules (11, 12, 16, 17, 18). Whether this activity is indicative of a peptide “sink” function or perhaps reflective of a more substantive role in peptide/class I assembly reactions remains to be determined. The potential functional significance of the peptide-binding activity is evident, though, in the observations that vaccination of mice with GRP94 can elicit a substantial cellular immune response to components of the bound peptide pool (11, 16, 17, 18, 19). Thus, GRP94, when isolated from a variety of host backgrounds, including tumor cells or cells expressing viral or bacterial proteins, was capable of eliciting substantial CD8+ T cell responses to the parent tumors, as measured in tumor-mass regression studies, as well as known viral and bacterial peptide epitopes, as determined by CTL assay (11, 16, 17, 19). The conclusion appears evident, then, that APCs are capable of internalizing GRP94-peptide complexes and that, following internalization, at least a subset of the peptides in association with GRP94 can be released and targeted for assembly onto class I molecules. From these data, it may also be postulated that in all cells, GRP94 associates with ER lumenal peptides, a subfraction of which are suitable for assembly onto class I molecules. Given the established role for calreticulin in the genesis of class I/peptide complexes and the propensity of ER chaperones to display peptide-binding activity, we investigated whether calreticulin displayed in vivo interactions with peptides. This question was addressed by direct biochemical analysis of acid-extracted, tissue-derived calreticulin and by the capacity of calreticulin purified from B16/F10.9, EL4, and E.G7-OVA tumors to elicit specific CTL responses. Direct chemical evidence supporting the existence of a calreticulin-bound peptide fraction was obtained. In addition, vaccination of mice with dendritic cells (DCs) pulsed with B16/F10.9, EL4, or E.G7-OVA-derived calreticulin, was observed to elicit CTL responses to undefined tumor-derived Ags B16/F10.9, EL4) or the immunodominant OVA peptide epitope, SIINFEKL (E.G7-OVA). Lastly, bone marrow-derived dendritic cells (BMDC) pulsed in vitro with E.G7-OVA-derived calreticulin presented tumor-specific peptides in association with class I molecules and were targeted for lysis by the OVA-specific CTL line, 4G3. Female C57BL/6 mice (H-2b, 5–6 wk old) and SCID mice were obtained from the Charles River Laboratories (Wilmington, MA). In conducting the research described in this paper, the investigators adhered to the Guide for the Care and Use of Laboratory Animals as proposed by the committee on care of Laboratory Animal Resources Commission on Life Sciences, National Research Council. The facilities are fully accredited by the American Association for Accreditation of Laboratory Animal Care. Cell lines used were EL4 (C57BL/6, H-2b, thymoma), E.G7-OVA (EL4 cells transfected with the OVA cDNA), RMA-S cells (Rauscher leukemia virus-induced T cell lymphoma RBL-5 of C57BL/6 (H-2b) origin), and B16/F10.9 (F10.9) melanoma. Cells were maintained in DMEM supplemented with 10% heat-inactivated FCS (Life Technologies, Grand Island, NY), 2 mM glutamine, 100 U/ml penicillin, and 100 μg/ml streptomycin. E.G7-OVA cells were grown in medium containing 400 μg/ml G418 (Life Technologies). T-cell hybridoma RF3370 (H-2Kb restricted, OVA specific) was maintained in RPMI 1640 (Life Technologies) supplemented with 10% heat-inactivated FCS, 2 mM glutamine, 100 U/ml penicillin, and 100 μg/ml streptomycin. The OVA-specific CTL line 4G3 (20) (H-2Kb restricted, OVA specific) was carried in RPMI 1640, 10% heat inactivated FCS, 2 mM glutamine, and 30 U/ml IL-2 (Genzyme, Cambridge, MA). Cells were split every 2–4 days and restimulated weekly with irradiated E.G7-OVA cells at a 1:1 ratio. OVA peptide (H-2Kb restricted, SIINFEKL, aa 257–264) and the control mut-1 peptide (H-2Kb restricted, FEQNTAQP) were purchased from Research Genetics (Huntsville, AL). Chaperone proteins were purified from solid tumors as described in Reference 21. Tumors were established in either C57BL/6 (B16/F10.9 melanoma) or SCID (EL4, E.G7-OVA thymoma) mice. Solid tumors were harvested, a microsomal, ER-enriched subfraction was prepared, and the ER chaperones GRP94 and calreticulin were purified to homogeneity from the microsomal fraction by selective detergent release, sequential MonoQ 10/10 anion exchange, Superdex 26/60 gel filtration chromatography (Pharmacia Biotech, Piscataway, NJ), and centrifugal ultrafiltration (Amicon, Beverly, MA), as described in Reference 21. The cytosol fraction obtained upon subfractionation of the tumor homogenate was used to purify Hsp90 and Hsp70. The cytosol fraction was initially subjected to a 50–70% ammonium sulfate fractionation. Protein precipitated at 70% ammonium sulfate was resuspended in buffer A (110 mM KOAc, 20 mM NaCl, 20 mM potassium HEPES, and 0.5 mM PMSF) and centrifuged for 20 min at 4°C (100,000 × g) to remove aggregated material, and the soluble fraction was fractionated by preparative gel filtration on a Superdex 26/60 column equilibrated in buffer A at a flow rate of 1.5 ml/min. Fractions containing Hsp70 or Hsp90 were identified by SDS-PAGE, pooled, and sequentially chromatographed on MonoQ 10/10 and Superdex 26/60 as described in Reference 20. BiP, ERp72, and PDI fractions arising from MonoQ fractionation of lumenal protein extracts, as well as Hsp70 and Hsp90 fractions eluting from the final Superdex 26/60 step, were adjusted to 10 mM sodium phosphate, pH 6.8, loaded onto 2.5-ml hydroxylapatite columns (Bio-Rad HTP, Hercules, CA), and eluted with a 25-ml gradient of 10–300 mM sodium phosphate, pH 6.8. By SDS-PAGE, the purity of the Hsp90 and Hsp70 fractions was determined to be >95% (data not shown). Protein purity was assessed by one- and two-dimensional SDS-PAGE. Calreticulin-associated peptides were extracted from 1 mg (21.7 nmol) of purified porcine calreticulin by denaturation for 30 min at room temperature in the presence of guanidinium chloride/1% trifluoroacetic acid (TFA). The acid-soluble fraction was separated from intact calreticulin by centrifugal ultrafiltration, using acid-washed Centricon-10 filtration units. The low m.w. calreticulin-derived peptide fraction was subsequently bound to a prewashed Sep-Pak C18 unit, washed extensively with 1% TFA, and eluted in 80% acetonitrile, 0.1% TFA. The acetonitrile eluate was dried by vacuum centrifugation, and fractions were either resuspended in 0.2 M sodium phosphate (pH 7.2) and subjected to reductive methylation with 3H-labeled sodium borohydride as described in Reference 22 or subjected to acid hydrolysis in vacuo, with the amino acid content determined by quantitative amino acid analysis. Quantitative amino acid analysis was performed by the Duke University Medical Center Protein Sequencing Facility, a core facility of the Duke University Comprehensive Cancer Center. As a consequence of acid hydrolysis, tryptophan content cannot be determined, and asparagine and glutamine are hydrolyzed to aspartate and glutamate. In reductive methylation studies, the radiolabeled pool was fractionated on Sephadex G-10 to remove unincorporated isotope, concentrated, and analyzed on a Pharmacia Superdex peptide column. Sample absorbance at 280 nm was continuously monitored. Fractions were collected, and 3H content was determined by liquid scintillation chromatography. Splenic DC or bone marrow precursor-derived DC were generated as described earlier (23, 24). Day 9 precursor-derived DC or splenic DC were pulsed with heat shock proteins in the presence of the lipid N-[1-(2,3-dioleoxyloxy)propyl]-N,N,N-trimethyl ammonium methylsulfate (DOTAP) (Boehringer Mannheim, Indianapolis, IN) or DMRIE (Vical, San Diego, CA). Heat shock proteins (in 100 μl Opti-MEM) and DMRIE or DOTAP (in 100 μl Opti-MEM) were mixed at room temperature for 15 min. The complex was added to the DC suspension in a total volume of 1 ml and incubated at 37°C in a water bath for 30 min. Alternatively, immature DC (day 7 precursor derived) were pulsed with heat shock proteins in the absence of DMRIE for 48 h. Naive, syngeneic mice were immunized i.v. with 5 × 105 precursor-derived DC or 1 × 106 spleen-derived DC per mouse in 200 μl of PBS. Splenocytes were harvested after 10 days and depleted of RBCs with ammonium chloride/Tris buffer. Splenocytes (1.0 × 107) were cultured with 5 × 105 irradiated stimulator cells (E.G7-OVA cells irradiated at 20,000 rad or F10.9 cells pretreated with IFN-γ and irradiated at 7,500 rad) in 5 ml of IMDM with 10% FCS, 1 mM sodium pyruvate, 100 IU/ml penicillin, 100 μg/ml streptomycin, and 5 × 10−5 M 2-ME per well in a 6-well tissue culture plate. Cells were cultured for 5 days at 37°C and 5% CO2. Effectors were harvested on day 5 on Histopaque 1083 gradient before use in a CTL assay. Target cells (5–10 × 106) were labeled with europium for 20 min at 4°C. Europium-labeled targets (104) and serial dilutions of effector cells at varying E:T ratios were incubated in 200 μl of complete RPMI 1640. The plates were centrifuged at 500 × g for 3 min and incubated at 37°C for 4 h. Fifty microliters of the supernatant was harvested and europium release was measured by time-resolved fluorescence (24). Specific cytotoxic activity was determined using the following formula: % specific release = [(experimental release − spontaneous release)/(total release − spontaneous release)] × 100. Spontaneous release of the target cells was <25% of total release by detergent in all assays. SE of the means of triplicate cultures was <5%. A highly enriched ER microsome fraction was prepared from tissue homogenates by differential centrifugation, and the lumenal protein components were subsequently isolated from the microsomes by partial detergent extraction (21). Under the described conditions, peripheral and integral ER membrane proteins remain in association with the detergent-permeabilized membranes and can thus be efficiently segregated from the lumenal protein extract by centrifugation. The supernatant fraction resulting from this step contains five major polypeptides, GRP94 (gp96), BiP, ERp72, PDI, and calreticulin. In the final stage of the purification, calreticulin and GRP94 undergo gel filtration chromatography and centrifugal ultrafiltration (21). These procedures, in addition to yielding homogeneous preparations of the two proteins, were performed to eliminate circumstantial interactions between either of the two chaperone proteins and low m.w. peptide substrates. To assess the purity of the calreticulin and GRP94 used in these studies, representative samples were analyzed by two-dimensional SDS-PAGE. As shown in Fig. 1⇓A, both proteins are, by this criterion, homogeneous. Chemical identification of calreticulin-bound peptides. A, Purity of chaperone fractions. Five micrograms of purified GRP94 and calreticulin was subjected to two-dimensional SDS-PAGE to ascertain purity. Digital images of Coomassie blue-stained gels are shown. B, Extraction of bound peptides. To determine whether conditions used for extraction of bound peptides resulted in hydrolysis or degradation of calreticulin, SDS-PAGE analysis was performed with the starting calreticulin (1.5 μg) (lane 1), concentrated pre-extraction retentate (1.5 μg) (lane 2), postextraction ultrafiltration retentate (15 μg) (lane 3), and postextraction filtrate (lane 4). A digital image of a Coomassie blue-stained gel is shown. C, Analytical gel filtration analysis of calreticulin-derived peptide pool. The low m.w. calreticulin-derived fraction was subjected to reductive methylation with 3H-labeled sodium borohydride, fractionated on Sephadex G-10 to remove unincorporated isotope, concentrated, and analyzed on a Pharmacia Superdex peptide column. Sample absorbance at 280 nm was continuously monitored. Fractions were collected, and 3H content was determined by liquid scintillation chromatography. D, Relative amino acid content of calreticulin-derived peptide fraction. Purified calreticulin (10.5 nmol) was extracted, the bound peptide fraction was subjected to acid hydrolysis in vacuo, and the amino acid content was determined by quantitative amino acid analysis. The relative amino acid abundance is presented, with glycine, the most abundant amino acid in the extract, assigned a value of 1.00. For comparative purposes, the amino acid composition of calreticulin is shown. Procedures were developed to extract calreticulin-bound peptides, and the peptide-enriched fraction was separated from intact calreticulin by centrifugal ultrafiltration. As depicted in Fig. 1⇑B, lane 3, SDS-PAGE analysis of the ultrafiltration retentate indicates that the conditions used for peptide extraction do not yield detectable hydrolysis or degradation of calreticulin. Analysis of the filtrate by SDS-PAGE analysis of the filtrate (lane 4) similarly shows no evidence of degradation products. To assay for the presence of peptides in the filtered extract, amine-specific radiolabeling (reductive methylation), followed by analytical gel filtration, or quantitative amino acid analyses were performed. Depicted in Fig. 1⇑C is the gel filtration elution profile of a representative fraction. When monitored at 280 nm, a broad band of UV-absorbing material was observed at elution volumes corresponding to m.w 600-1500. This range of elution volumes overlapped with the elution of the radiolabeled material. For the radiolabeled material, the leading edge of the initial primary peak encompassed elution volumes corresponding to m.w. 1000–1900. In a paired analysis, an equivalent quantity of calreticulin was extracted, and the peptide-enriched fraction, corresponding to the elution profile depicted in Fig. 1⇑C, was subjected to acid hydrolysis and quantitative amino acid analysis. Fig. 1⇑D details the amino acid composition of the eluted material. For comparative purposes and to assess whether the low m.w. peptide fraction was a general calreticulin degradation product, the relative amino acid composition of calreticulin is depicted. The most abundant amino acid present in the calreticulin eluate was glycine, with the relative enrichment of those amino acids comprising >20% of the total following the order Gly >Glu/Gln>Ser>Asp/Asn>Ala>Leu. On the basis of quantitative amino acid analysis, and with the as yet unsubstantiated assumption of a mean average peptide m.w. of 1000, approximately 200 pmol of total peptide was recovered from 10 nmol of calreticulin. To determine by immunological criteria whether calreticulin copurifies in association with host tissue-specific peptides, the capacity of calreticulin to elicit CTL responses in vivo was investigated in two model systems, the B16/F10.9 melanoma and EL4/E.G7-OVA (24, 25, 26). For experiments using the B16/F10.9 model, the ER chaperones GRP94, BiP, ERp72, PDI, and calreticulin were purified to homogeneity from an F10.9 tumor-derived microsomal fraction. Control proteins were purified from either a normal spleen-derived microsomal fraction or from a porcine pancreas rough ER fraction (21). Mice were immunized i.v. at 14-day intervals with 10 μg of GRP94 or calreticulin, isolated from either F10.9 tumors or pig pancreas. A total of two immunizations were performed. Splenocytes were isolated from the immunized mice 10 days after the last immunization and were restimulated in vitro with irradiated IFN-γ-pretreated F10.9 cells, and CTL activity was assayed subsequently against F10.9 (H2-Kb), EL4 (H2-Kb), or BALB/3T3 (H2-Kd) cells. The results of a representative experiment are depicted in Fig. 2⇓. Immunization with F10.9-derived calreticulin or GRP94 elicited a significant CTL response, and the maximum level of CTL lysis observed was comparable for both proteins. 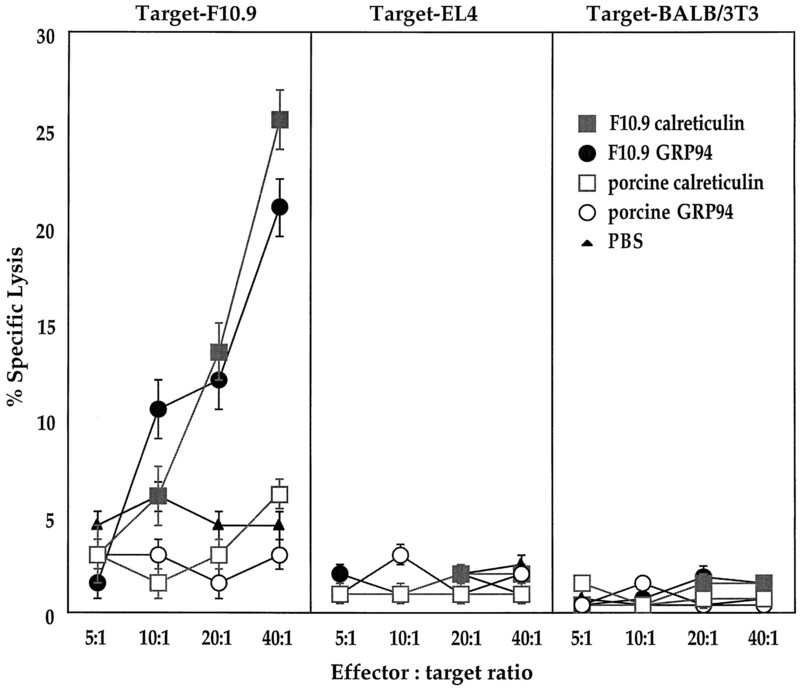 That the observed CTL response, elicited by F10.9-derived calreticulin and GRP94, was specific for F10.9 cells was further substantiated by the fact that the control target cells, EL4 and BALB/3T3, exhibited no lysis (Fig. 2⇓). Furthermore, no CTL responses were generated in mice immunized with DC pulsed with porcine calreticulin, porcine GRP94, or PBS. From these data, it is clear that tumor-derived calreticulin and GRP94 elicit an F10.9-specific CTL response. Immunization with tumor-derived calreticulin or GRP94 elicits tumor-specific CTL responses in vivo. Mice were immunized i.v. twice, at a 14-day interval, with 10 μg of chaperone protein. Splenocytes were isolated from the immunized mice 10 days after the last immunization and restimulated in vitro with irradiated IFN-γ-pretreated F10.9 cells. CTL activity was assayed using F10.9 (H2-Kb) cells as targets. EL4 and BALB/3T3 target cells were included as controls for the specificity of the CTL response. To further extend the conclusions obtained from the experiments depicted in Fig. 2⇑, the ability of the different ER chaperones to elicit a CTL response was investigated. In these experiments, mice were immunized two times with spleen-derived DC pulsed, in the presence of a cationic lipid, either with mouse spleen-derived calreticulin, GRP94, or ERp72, or with F10.9-derived calreticulin, GRP94, ERp72, BiP, or PDI. Ten days after the final immunization, splenocytes were isolated and restimulated, and CTL activity was assayed against F10.9 and EL4 cells (Fig. 3⇓). Consistent with the data depicted in Fig. 2⇑, immunization of mice with F10.9 calreticulin or GRP94-pulsed precursor-derived DC elicited a significant CTL response. It is noteworthy that only low levels of CTL were generated by vaccination with tumor-derived PDI, ERp72, or BiP, although it is well established that these chaperones display peptide-binding activity (13, 14). In these experiments, immunization with spleen-derived calreticulin, GRP94, or ERp72 yielded little or no CTL. The control target EL4 showed no lysis. These results, as with those depicted in Fig. 2⇑, demonstrate that immunization with calreticulin or GRP94-pulsed DC is sufficient to elicit a CTL response against Ags derived from the chaperone-host cell. The capacity to elicit tumor-specific CTL responses is primarily limited to calreticulin and GRP94. Spleen-derived DCs were pulsed with either B16/F10.9 or mouse spleen-derived ER chaperone proteins in the presence of the cationic lipid DMRIE as described in Materials and Methods. Naive, syngeneic mice were immunized i.v. with 5 × 105 DC per mouse in 200 μl of PBS, two times, at a 14-day interval. Splenocytes were harvested 10 days postimmunization and restimulated with irradiated F10.9 cells pretreated with IFN-γ. CTL activity was assayed against F10.9 cells and EL4 target cells. In the F10.9 system, immunization with tumor-derived calreticulin and GRP94 elicits a polyclonal CTL against an undefined set of tumor-associated Ags. Although such results clearly identify these two proteins as immunogenic, the lack of insight into the identity of the relevant tumor Ag(s) hampers further investigation into the molecular basis for this activity. Additional experiments were thus performed to determine whether calreticulin and GRP94 associate with a known MHC class I peptide epitope, as defined by immunological criteria. For these experiments, the EL4/E.G7-OVA system was used. E.G7-OVA cells are a clonal derivative of the EL4 tumor cell line (H-2b haplotype) and were selected for stable transfection with the chicken OVA cDNA (27). In a C57BL/6 (H-2b) mouse background, expression of the chicken OVA gene yields the production of a single immunodominant OVA peptide epitope (aa 257–264) (27). With respect to these studies, the EL4/E.G7-OVA experimental system offers two useful and interesting properties. 1) Chaperone-elicited CTL responses against the OVA epitope can be assayed using OVA-specific clonal CTL lines. 2) The hypothesis that calreticulin and GRP94 bind unique and nonoverlapping arrays of peptide substrates can be directly tested in determinations of shared EL4/E.G7-OVA CTL induction. To prepare the relevant chaperone proteins, E.G7-OVA and EL4 tumors were established in SCID mice, a cytosol and microsome fraction prepared from excised tumors, and calreticulin, GRP94, Hsp90, and Hsp70 isolated from the relevant subcellular fractions. Splenic DC were pulsed in the presence of the cationic lipid DOTAP with calreticulin, GRP94, Hsp90, or Hsp70, and mice subjected to a single i.v. vaccination. Splenocytes were subsequently isolated from the immunized animals and stimulated with irradiated E.G7-OVA cells, and CTL assays were performed (Fig. 4⇓). As is evident in Fig. 4⇓, E.G7-OVA-derived calreticulin and GRP94 elicited robust CTL responses against E.G7-OVA target cells. A substantial CTL response was also observed in the case of E.G7-OVA Hsp70 (Fig. 4⇓). The data regarding GRP94 and Hsp70 are in agreement with previous studies demonstrating that GRP94, HSP70, and to lesser extent HSP90, when isolated from appropriate cells, prime Ag-specific CTL in vivo (16, 19). Particularly noteworthy in the data depicted in Fig. 4⇓ is the observation that immunization with EL4-derived calreticulin elicited CTLs against the E.G7-OVA target. These data can be explained by the fact that E.G7-OVA is a clonal derivative of EL4, transfected with the OVA gene. Because the two cell types are genetically very similar, a substantial overlap in the spectrum of the immunogenic peptides expressed by the two cell types would be expected. As chaperones by nature bind a diverse array of peptides, the only predictable difference between the peptides bound to calreticulin derived from E.G7-OVA cell and EL4 cells would be the presence of the OVA peptide, bound to the E.G7-OVA-derived calreticulin. Thus, when the splenocytes from immunized mice were restimulated with E.G7-OVA cells, in the instances in which EL4-derived heat shock proteins were used for immunization, only the EL4/E.G7-OVA-shared CTL would be restimulated. Conversely, when the E.G7-OVA-derived heat shock proteins were used for immunization, both the shared EL4/E.G7-OVA and the OVA-specific CTL would be restimulated. Priming of OVA-specific CTL following immunization with E.G7-OVA chaperone-pulsed DC. GRP94, calreticulin, Hsp90, and Hsp70 were purified from E.G7-OVA and EL4 tumors. Spleen-derived DC were pulsed with the indicated chaperones in the presence of the cationic lipid DOTAP as described in Materials and Methods. Mice were subjected to a single immunization with 1 × 106 chaperone-pulsed DC, and splenocytes were harvested after 10 days and restimulated in vitro with irradiated E.G7-OVA cells. CTL assays were performed as described in Materials and Methods with E.G7-OVA cells and EL4 cells as targets. As a control for CTL specificity, parallel assays were performed with F10.9 (H-2b melanoma) as target cells. When EL4 cells were used as targets (Fig. 4⇑), a similar overall pattern was observed. Notably however, E.G7-OVA-derived calreticulin and GRP94 elicited a more substantial CTL response to EL4 target cells than that elicited by the EL4-derived calreticulin or GRP94. It appears that the E.G7-OVA-derived proteins are of higher relative antigenicity than those obtained from EL4. The molecular basis for this phenomenon is not understood and is being further investigated. On the premise that the relative antigenicity of the chaperones is a direct function of the complement of bound peptides, these data indicate that the spectrum of immunogenic peptides present on the EL4 and E.G7-OVA chaperones displays significant similarities, as both elicit CTL responses against the related cell line, and significant differences, as the E.G7-OVA chaperones are more immunogenic. To alleviate concerns regarding CTL specificity, control experiments with an unrelated target cell line (F10.9) were performed (Fig. 4⇑). With F10.9 as the target cell, no significant CTL activity was observed in splenocyte preparations derived from animals immunized with any of the chaperone preparations. These data substantiate the conclusion that the CTL activity observed against E.G7-OVA and EL4 target cells is specific, and thus, that the observed cross-cell reactivity is, at a fundamental level, a reflection of shared immunogenic epitopes copurifying with the different chaperone protein preparations. To better define the OVA specificity of the observed CTL responses, the capacity of immature BMDC to present calreticulin-associated peptides and be recognized for lysis by OVA-specific CTL was investigated. Immature BMDC, as professional APCs, process and present exogenous Ags on the class I pathway and are thought to utilize this pathway for the activation of CD8+ CTL in vivo (28, 29, 30). Immature murine BMDC were pulsed with the immunodominant OVA peptide (SIINFEKL), a control peptide (mut-1), EL4 calreticulin, or E.G7-OVA calreticulin, and, following maturation, class I presentation of the OVA epitope was assayed by a CTL assay. In these assays, peptide- or chaperone-pulsed BMDC served as target cells, and the OVA-specific CTL line 4G3 as effector cells. As shown in Fig. 5⇓A, immature BMDC pulsed with E.G7-OVA-derived calreticulin present OVA for recognition and lysis by 4G3 CTLs, whereas no activity was observed for EL4 calreticulin. The specificity of this response is further supported by the data demonstrating that sensitization of the E.G7-OVA-calreticulin-pulsed BMDC to lysis by 4G3 was dependent on the concentration of E.G7-OVA calreticulin present in the medium. As additional controls, it was observed that lysis could be elicited by the OVA peptide, whereas a 100-fold excess of the control peptide was without effect. Calreticulin-bound OVA peptide gains access to the MHC class I presentation pathway of professional APCs. A, Murine BMDCs were generated as described by Mitchell et al. (23). On day 7 of the culture period, nonadherent cells (immature DC) were labeled with europium and pulsed for 48 h with the indicated source and concentration of calreticulin or OVA peptide. After 2 days in culture, nonadherent cells were harvested as mature DCs, washed, and used as targets. Cells were assayed for peptide SIINFEKL (OVA) presentation on MHC class I by CTL assay using the OVA peptide-specific CTL line 4G3 (20). B, Day 7 BMDCs (immature DC) were pulsed for 48 h with the indicated source and concentration of calreticulin or OVA peptide. After 2 days in culture, nonadherent cells were harvested as mature DCs, washed, and used as stimulators. The cells were assayed for presentation of class I-restricted OVA peptide to the OVA peptide-specific T cell hybridoma RF3370 (anti-OVA, Kb). RMA-S cells were incubated in the presence of either control peptide (mut-1; FEQNTAQP) or OVA peptide overnight at 37°C. In this assay, OVA presentation and recognition were assayed as the stimulation of IL-2 secretion. IL-2 production was measured using ELISA according to the manufacturer’s instructions (Endogen, Cambridge, MA). These observations were further expanded in the experiment depicted in Fig. 5⇑B. In this experiment, presentation of the class I-restricted OVA epitope was assayed using a T cell hybridoma IL-2 secretion assay. In this assay, BMDC were cultured in the presence of E.G7-OVA or EL4-derived chaperone proteins, harvested, and assayed for their ability to stimulate IL-2 secretion from a class I-restricted, OVA-specific T cell hybridoma (23). For comparative purposes, IL-2 secretion elicited in response to RMA-S cells pulsed with either control or OVA peptide was assayed. As depicted in Fig. 5⇑B, the OVA specificity of the assay was confirmed by data demonstrating that neither control peptide nor EL4-derived calreticulin elicited IL-2 secretion, whereas OVA peptide elicited a dose-dependent production of IL-2 (Fig. 5⇑B). 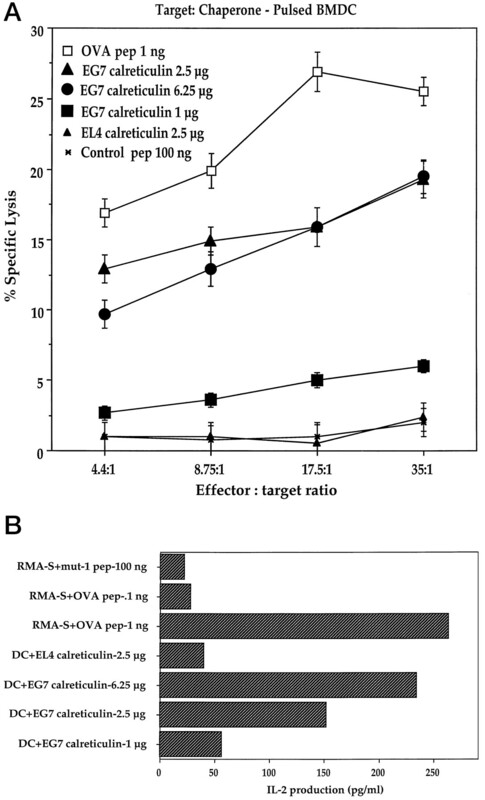 E.G7-OVA-derived calreticulin-pulsed BMDC exhibited a dose-dependent stimulation of IL-2 secretion. These data clearly demonstrate that calreticulin-associated OVA peptide, or a structural precursor(s), was processed by BMDC and presented for recognition by the OVA-specific, class I-restricted T cell hybridoma. The results reported herein provide immunological and chemical evidence that calreticulin is a peptide-binding protein. Furthermore, these data demonstrate that at least a subset of the peptides bound by calreticulin are appropriate ligands, or ligand precursors, for nascent MHC class I molecules. The potential immunological significance of these data is highlighted by the observation that pulsing of BMDC with soluble, exogenous calreticulin yielded presentation of calreticulin-derived peptides in association with BMDC class I molecules and lysis by an OVA-restricted CTL line. In addition to demonstrating that calreticulin and GRP94 can elicit CTL responses against components of their bound peptide pool, these data make evident the possibility that persistent release of calreticulin or GRP94 into the extracellular space, as might arise in chronic inflammation or tissue necrosis, may elicit a CTL response against the tissue composing the site of chaperone release. At present, it is not known how calreticulin or GRP94-associated peptides gain access to the ER of professional APCs and thus whether the elicitation of a class I-restricted immune response, which accompanies transfer of the chaperone-associated peptides to MHC class I molecules, reflects a component part of a ubiquitous, calreticulin- and/or GRP94-dependent pathway for peptide loading onto class I molecules; the existence of a pathway, perhaps unique to professional APCs, that supports the trafficking of chaperone-peptide complexes; or the peptides themselves, from the extracellular space to the ER. It is noteworthy that calreticulin has been demonstrated to perform a critical, although undefined, role in class I/β2m/peptide assembly in the ER (6, 7, 8, 9). It is premature, though, to invoke a direct peptide loading function for calreticulin, as the detailed molecular pathway for peptide loading onto class I molecules, and the contribution of calreticulin to such a pathway, has yet to be determined. Further clouding speculation on these matters is the absence of insight into how peptide release from calreticulin and GRP94 is regulated, or, for that matter, if the dissociation of peptides from these proteins is a regulated event. In one scenario, calreticulin and/or GRP94 could interact reversibly with ER-localized peptides and thereby assist in the transfer of peptides, directly or indirectly, onto class I molecules. Alternatively, peptide release might only arise as a consequence of proteolysis, such as may accompany internalization into APCs and degradation in endosomal/lysosomal compartments. In the latter scenario, calreticulin-peptide complexes would be kinetically stable, and thus the antigenic profile of bound peptides would vary as a function of the metabolic half-life of the chaperone protein rather than the steady-state variation in ER peptide levels. With these uncertainties in mind, insights into the physiological role(s) of calreticulin and GRP94 in the peptide-trafficking pathways of the ER and in the elicitation of CD8+ T cell responses will benefit from an understanding of the compartmental specificity, regulation, and kinetics of peptide binding. The studies of Srivastava and colleagues yielded the surprising and provocative observation that GRP94 can, through its activity as a peptide-binding protein, elicit CTL responses in vivo and in vitro (16, 19, 31). We have observed that calreticulin displays activity similar to that of GRP94. As discussed by Srivastava and colleagues, a noteworthy, and perhaps unique, aspect of chaperone-based immunotherapeutics concerns the diversity of chaperone-bound peptides, a diversity that may be reflective of the antigenic repertoire of the host cell (31). This conclusion is particularly evident in the data presented in Fig. 4⇑, in which the capacity of ER lumenal chaperones derived from EL4 and E.G7-OVA thymoma tumors to elicit CTLs directed against EL4 and E.G7-OVA was determined. In focusing on the data obtained with calreticulin and GRP94, it is evident that when derived from E.G7-OVA, both proteins were observed to elicit a substantial CTL response to both the parent (E.G7-OVA) and the precursor (EL4) cell lines. Although the shared peptide Ags remain to be identified, these data clearly illustrate that both calreticulin and GRP94 copurify with an array of antigenic peptides capable of assembly on class I molecules and reaffirm the potential immunotherapeutic utility of these proteins, that being their capacity to elicit a CTL response against the parent, and genetically related, cell hosts, in the absence of the identification of specific peptide Ags (31). That the E.G7-OVA-derived proteins display a substantially higher antigenicity than those obtained from EL4 may be most simply explained by assuming that the spectrum of immunogenic peptides associated with E.G7-OVA chaperones differs significantly from those in association with the EL4-derived proteins. Thus, although there must indeed be shared immunogenic epitopes capable of eliciting a CTL response against the two related cell lines, there must exist differences in either the relative abundance or structure of these as yet unknown immunogenic epitopes. An alternative, and admittedly speculative, hypothesis is that the lytic activity elicited by E.G7-OVA-derived, but not EL4-derived, calreticulin, GRP94, or HSP70 on EL4 targets may reflect a “helper” effect of the strong OVA epitope, which serves to alter “tolerance” against the weaker tumor epitopes expressed by EL4, by a mechanism similar to that previously observed upon expression of foreign Ags in tumor cells (32). An appreciation of the fundamental cell biological significance of chaperone-elicited CTL responses will accompany insights into the structural characteristics of the peptide substrates bound by these molecules and the cellular trafficking pathways accessed by the proteins and their peptide substrates in APCs. With respect to the issue of protein trafficking, it will be of particular interest to determine whether calreticulin and/or GR94 function in vivo as physiologically relevant components of the immunological pathway(s) supporting cross-priming (29, 30, 31, 33, 34). ↵1 This work was supported by National Institutes of Health Grant DK53058 (to C.V.N.). These results were presented by C.V.N. at the Cold Spring Harbor Laboratory conference “Molecular Chaperones and the Heat Shock Response,” May 6–10, 1998, Cold Spring Harbor, NY. ↵3 Abbreviations used in this paper: ER, endoplasmic reticulum; TAP, transporter associated with Ag presentation; β2m, β2-microglobulin; DC, dendritic cell; DOTAP, N-[1-(2,3-dioleoxyloxy)propyl]-N,N,N-trimethyl ammonium methylsulfate.